Memo to Fiction Authors–Make Sure It’s Fiction! Why? Because if you say anything on any copyright page or whatever that anything in the book/novel is based on any actual event, that (unlike the old days when one could write a novel “based on a true story” and call it “fiction”) apparently that is no longer the case. In these days when it is so easy to “offend” someone–and I’m not just talking so-called “SJWs” here…does no one have the capacity to develop thick skin anymore? Is it against the “law” to develop thick skin these days? In these days when “getting offended” is the prevailing narrative, can a fiction novelist such as myself get into trouble for putting actual “brands” into my novels? Musical instrument companies Fender and Gibson–Gibson guitar and Fender bass. Car companies–Bentley, Rolls Royce, Ferrari, BWM, Mercedes-Benz, Lamborghini and others. Gee, will someone get offended because one of my band characters is bisexual? And, when he repents of being bisexual, will an actual bisexual be offended? And two more days on changing the names of the media conglomerates I mentioned in my novels! Thank God I’m not a best selling author–I’d have been sued a zillion times by now! Finally, EVERY real person known to be a real person had to be expunged from the e-book. AND I COULD NOT EVEN MENTION THE BEATLES, THE BAND MY FICTIONAL BAND IS FASHIONED AFTER! No Elton John, no Jimi Hendrix, no Jimmy Page, no Kurt Cobain, no actual rock band, no actual pop star (I even removed the late Michael Jackson! Just because…). No actual business, government department or agency, non-profit org, no actual religious group except for the fact that major religions exist, no actual churches, no mention of actual books, records, movies, works of art, buildings. And no mention of actual presidents, prime ministers, royalty. Even historical figures are taboo..but I did mention William the Conqueror aka William of Normandy. Will that have to be expunged also? And I am NOT BLAMING LULU.COM for this! I am not blaming Lulu.com for me having to take two weeks to revise my manuscript. Lulu is only doing what any wise online company would do in the day and age of zillions of “libel” suits for no reason. One of my fave news sites has been sued for using a photo without “attribution” to the photographer EVEN THOUGH THE PHOTO CAME FROM A COPYRIGHT-FREE AND ROYALTY-FREE WEBSITE! Because suddenly one day the photographer figured he or she would null the copyright and royalty free status of the photo…just because! That is why my e-book cover art WILL use a photo that I took in 2009 of a July 4th fireworks show at an actual amusement park at night. Since I can no longer trust actual photographers anymore! So, my advice is this: before sending any manuscript to Lulu or Kindle or whatever for print or e-book publication, use your fave search engine to see if the company you think does not exist actually does exist. I mean, there are only about a million media outfits these days! Need a record label? Make sure discogs.com doesn’t list it anywhere! If there are only one or two listings, DON’T USE IT! If you need to use an actual well-known person or celebrity, make sure that person is dead! Dead persons cannot sue for libel! Finally, since you will likely use the name of an actual person who actually exists, make sure you indicate that “names of real people, real places, and real things are used only for fictional purposes.” Instead of using “brands,” use generalizations: car instead of car brand name, hotel instead of actual hotel name, guitar instead of Gibson guitar, etc. Author deborahlagardePosted on March 6, 2019 March 6, 2019 Categories cover art, Fiction Writing, Libel Suits, Novel Creation, The Prodigal Band Trilogy, Uncategorized, writing experienceTags Brands, Fiction, Fictional Purposes, Libel Suits, Novel RevisionLeave a comment on Memo to Fiction Authors–Make Sure It’s Fiction! All I have to do now is the “Afterword” or something at the end of the book to explain how this book and the three trilogy original books came about. By Monday the latest, the e-book The Prodigal Band Trilogy–the three-books-in-one e-book that should be available on Amazon Kindle, Kobo (now including WalMart), Barnes and Noble Nook, Lulu and other platforms in a few months, after all the formatting by Lulu’s “team” and cover art is done, and I, the author, gives my okay. When the e-book is being distributed on various platforms, I will likely reduce the price of both printed books, Battle of the Band and The Prophesied Band, but shipping, between four and five dollars, will remain the same. 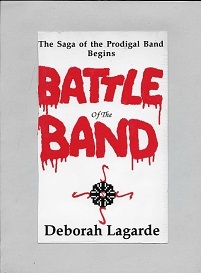 The FREE PDF The Prodigal Band will remain available for download for Free here. Above is another possible piece of cover art, based on a photo I took in 2009 at Sea World in San Antonio, Texas. As much as I like Pexels.com, someone I know is now sued by a photographer for “copyright infringement” for using a “free stock photo” from Pexels! Not blaming Pexels here, but apparently that photo he or she posted there was removed by the photographer later so the bogus “suit” could go through. So from here on in, if I need cover art, I’ll just do it myself. And Getty images charges too damned much for the rights to a license over a photo! If Lulu wants to change the cover art that’s up to them. Forthcoming: The Prodigal Band Trilogy-Combined E-book for Sale! And Happy New Year to All Downloaders of My FREE PDF “The Prodigal Band”! Just checked the stats for the first time in 2019. More downloads of my FREE PDF E-book “The Prodigal Band” than I expected! Thanks for downloading this book! Happy New Year to you all! But here is why I have no posted since around Christmas when I had been posting articles about my books and the characters: Since late December, I have been working on formatting ALL of the three Prodigal Band Trilogy books, printed and PDF, into ONE E-BOOK, mainly for the sake of those folks I know who simply cannot read the FREE book on their E-Readers (Kindle, Nook, Smashwords, Kobo, etc…folks, it won’t even work on the free Caliber e-reader that Lulu recommends! ), and also for those who would rather pay for the two printed books by credit card–I am NOT taking credit card payments, period, because of privacy issues and also hackers…in the last five years our credit card account has been hacked numerous times! All a hacker would have to do is hack into my (possible) PayPal account to screw up a customer–or PayPal could–as has been done to other free speech advocates, for I am a free speech advocate–simply close my (possible) PayPal account, for no reason other than “it’s personal”… So I figure, since I am re-typing the two printed books into Microsoft Word format (that is, Battle of the Band and The Prophesied Band), why not re-format the PDF The Prodigal Band as well? All I have to do is re-format the most important parts and “tell” over parts I am not including (the revisions will mean the book section will be about half the size of the original PDF). By the end of January, I will submit the “three books in one” The Prodigal Band Trilogy to Lulu Publishing, the will finish the formatting and whatever else needs to be done, and then distribute the e-book to various e-book sellers (Lulu, Amazon, Barnes and Nobel, Kobo (that is, WalMart and others), etc. and I will link to the sites on my Book Store. When the project is completed, I will let everyone know! Thanks for your support! Happy New Year and Happy Reading! 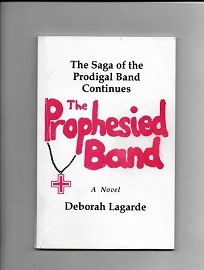 Author deborahlagardePosted on January 10, 2019 January 10, 2019 Categories Book advertising, Book Selling, EPub Formatting, Independent Publishing, Lulu E-book Platform, Purchase Books!, The Prodigal Band FREE PDF e-book, The Prodigal Band Trilogy, UncategorizedTags E-Book Creation, E-Readers, Happy New Year, The Prodigal Band FREE PDF e-book, The Prodigal Band TrilogyLeave a comment on Forthcoming: The Prodigal Band Trilogy-Combined E-book for Sale! And Happy New Year to All Downloaders of My FREE PDF “The Prodigal Band”!